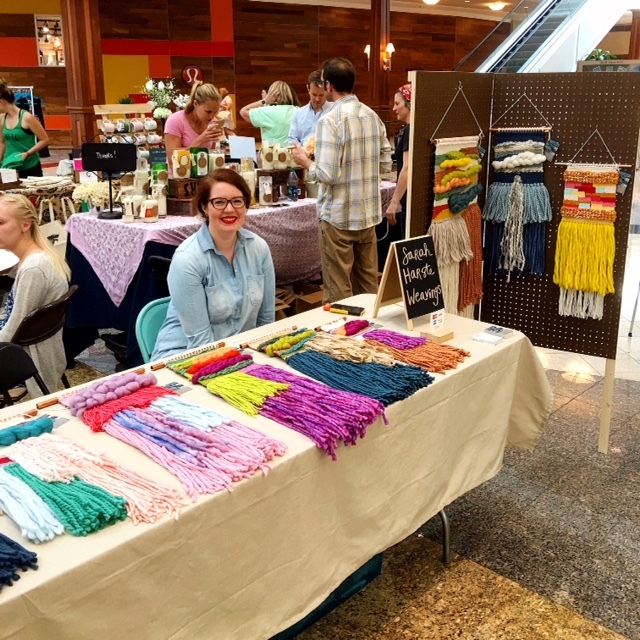 Ask Me Anything: How do you prepare for craft shows? This post is part of my "Ask Me Anything!" series. Gabi (@gsmcreates) sent me a direct message on Instagram asking if I had any advice on preparing for craft shows. Thanks for your patience with me getting back to you! The biggest hurdle I've had with events is figuring out my set up, especially with having a larger product that looks better hanging. I would definitely practice your set up ahead of time (I usually just set up my 6' table in our living room or guest room!) and lay everything out. I'd recommend investing in a table cloth, but as for your sign, don't feel like you need to get too out of control. I felt the need to do this big hanging sign for my first couple of shows (it was a pain to put up) -- and now I just use a little chalk board sign that I got for maybe $3 or $5 from Michaels. I think I was worried about not having "branding" -- but the great thing with having weavings is that THEY are your brand speaking for you. They're highly personal and artistic on their own. Definitely get a Square or Etsy reader. Almost 100% of my sales have been credit card. It takes a bit longer for an Etsy reader to get to you (or at least for me they were out of them when I first requested one! ), but a Square one you can even go buy at Target for $10 if you're in a pinch. Or you can order one on the Square website and it's free (and they ship pretty quickly!) I do prefer using my Etsy reader because it takes the item out of my Etsy shop for me when it sells and it counts towards my Etsy sales, which makes me look like a more established seller and gains more customer trust! As for product: I think it's good to have a variety of price points. Some people feel better about spending money for a $50 item when there's a $100 item that they also wanted (but resisted the temptation to buy). It creates a sales funnel -- a customer may buy one of your cheaper products and then log into your site and buy a more expensive product they've been lusting over for awhile later. I think it's GREAT that you have necklaces -- weavings are interesting because (at least where I'm at in Ohio!) a lot of people have never seen them before so they're a little confused by them or don't know quite what to make of them. But then when they see my stuff for a second or third time (at another show or online) they feel a little more familiar with them and "warmed up" to the idea of weavings. But a necklace -- everybody knows what a necklace is and it's already incorporated to into their spending habits. So they might see your stuff and be like "oh, look at this hip, different necklace. I've never seen a necklace like THIS before." And they'll feel excited by that because it's familiar but it's different. And buying jewelry for yourself feels like one of those little indulgences that we all love :) I've been considering adding necklaces to my product line for a couple months now -- we'll see! Packing: be aware of how you'll be unpacking to set up your table when you pack your stuff up for your show (and make a checklist that you can use for future shows!) My first couple shows I packed all my table stuff on the bottom of my tubs (I use clear plastic tubs) and my weavings on top -- because I didn't want to squish them! -- but then when I got to the show, I had to take all my weavings out and set them aside to get to the stuff I needed to put on the table first. Now I do one tub of weavings and one tub of table stuff. A lot easier! Packaging: My first couple of shows I was REALLY awkward trying to roll weavings up to put them in bags. Definitely give yourself a little space to pack stuff up (either on your table behind your sign or on top of my tub is what I do). I roll up my weavings in a piece of tissue paper and tape it shut with washi tape and put it in a paper bag. And I always throw a business card in there (even if they already picked one up) so they'll have an extra to give to a friend. If you don't have time to order cards before an event (or the funds... I was a little stressed about spending the money on them for my first event! ), just make some yourself. It's better to give them something with your information on them than nothing. Lastly, I would suggest that you go into each show with an objective in mind. I mean yes, selling some stuff would be great -- but honestly, some shows are slow and you just don't get the sales you're hoping for. My biggest objectives have been to grow my reach and become one of the most well-known "weavers" in Columbus. So the first couple shows my big goal was to get a few new instagram followers, and then lately it's been informing people about my upcoming weaving workshop and getting them to sign up for my newsletter. (Side note: even if you don't have a newsletter yet, I would take a clipboard and collect names. It's never too early to start growing your newsletter list.) So if I've done those things by the end of the show, I feel good about it. Also become friends with your neighbor. Look at their stuff and compliment it. Follow each other on instagram. The best part about all this so far is making new business besties! Oh, and I always bring my loom and weave at events. I've read some stuff saying that you shouldn't do anything that is taking your attention away from your customers, but I feel uncomfortable just watching people look at my stuff. I usually will smile and say "hi -- let me know if you have any questions! Feel free to touch the weavings; they've very soft!" and then keep weaving and just make sure I engage with them if they seem like they want to engage with me. Some people are nervous at craft shows (myself included -- I never want a vendor to think that I don't like their stuff!) and I feel like it's better just to give them a little space while they are shopping. Plus since a lot of people aren't really familiar with weaving, I think actually doing my craft at the event gives them a better sense of what goes into it! Plus weaving is really easier to put down and pick back up for breaks or chats. I really hope this helps! Prepare as much as you can, but don't go nuts. I learn something at every show that I implement at the next one. There's no shame in being a craft show newbie, so don't feel shy about it if there are more experienced vendors at the shows you're at! I can't wait to see pictures of your set-up! !